A Dad and Reddit user shared an image of a bathroom cubicle in Japan and we sure are impressed! "A place to hang your kid while you poo and then wash your sprocket", he captioned it. Sometimes you just wanna have your poops in peace, you know? With this little contraption, children can now rest easily while you do your thing, and you don't have to worry about what to do with them or how to hold them while you're busy. Some bathrooms don't even have place for you to put your cellphone or hang your handbag, but this one is just on another level. "I spend the whole time telling my kids not to touch anything"
A big problem a lot of parents experience is children touching everything in toilet cubicles which as you can imagine, is not the most hygienic place. This minimises the chances of children touching things and contracting any nasty diseases in public toilet cubicles. Keeping kids from licking, uh...drains? "When she turned back around, kiddo had his tongue on the floor drain." Can you imagine that? Let's face it, little kids do some pretty strange and gross things sometimes. You could never be too sure when they'll be licking drains or anything equally as disgusting. Pop that precious little sucker in the baby holder and you're good to go. Some feel that this is a viral video just waiting to happen. Fair enough, it has the potential to be a bit of a risk too. Apparently toilet cubicles are a great place for kids to play peek-a-boo too, who would've thought? The baby holders will certainly keep their curiosity at bay and prevent random strangers from getting a nasty little shock while doing their business. These parents are concerned with the fact that their children might leave the cubicle and wander off while they're still very much busy in the cubicle. As you can imagine, this becomes a safety issue too so the baby holder will keep kids safe. I sincerely hope this father is joking, but in the unfortunate situation that he isn't, this contraption will stop babies from being hung up like a coat hanger. 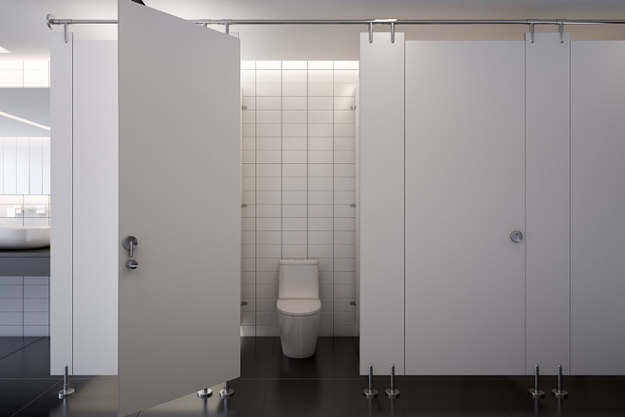 So while Japan might have reached "peak bathroom", there are still a bit more concerns. The good seems to outweigh the bad though. But I think it's great that they're being more inventive and actually catering for parents in ways that other public restrooms might not be. What makes this even better is that it's found in a Dad's toilet cubicle, and as you may have come to realise, there aren't many public toilets that cater for dads and children. Good on you, Japan (and any other restroom that may be doing this). Have you come across a baby holder in a toilet cubicle before? What are your thoughts on them? Let us know by emailing us at chatback@Parent24.com and we could publish your comments. Do let us know if you'd like to remain anonymous.